Here is an image showing the issue. All of the nodes should be roughly on the line, but they end up being placed slightly offset in the direction of dragging. 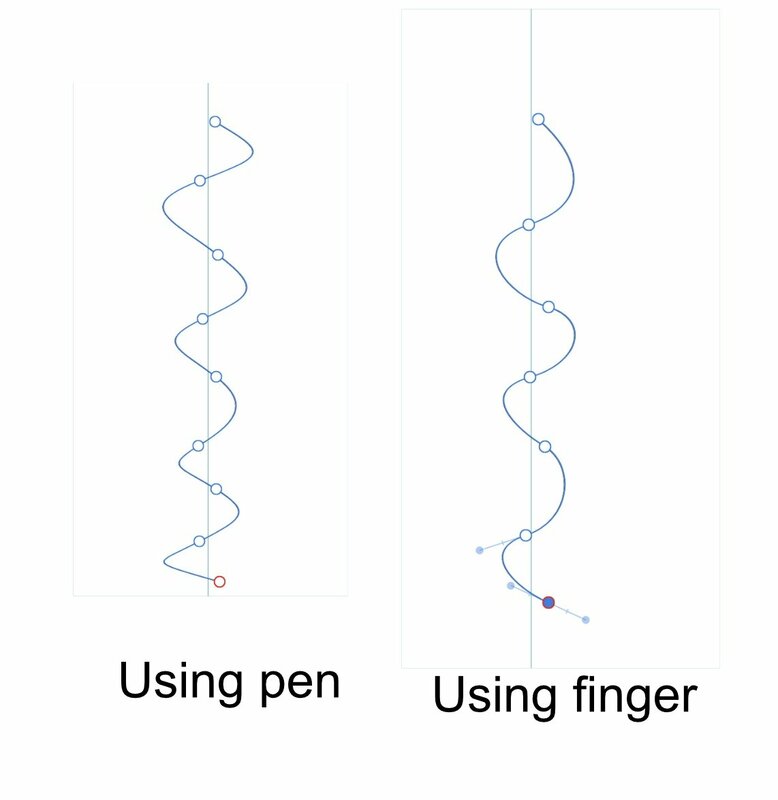 The issue occurs with both the pen and using a finger. When using a finger it's harder to see the problem because the inaccuracy is hidden underneath the finger, but hopefully this quick test shows the issue is not specific to the Apple Pencil. 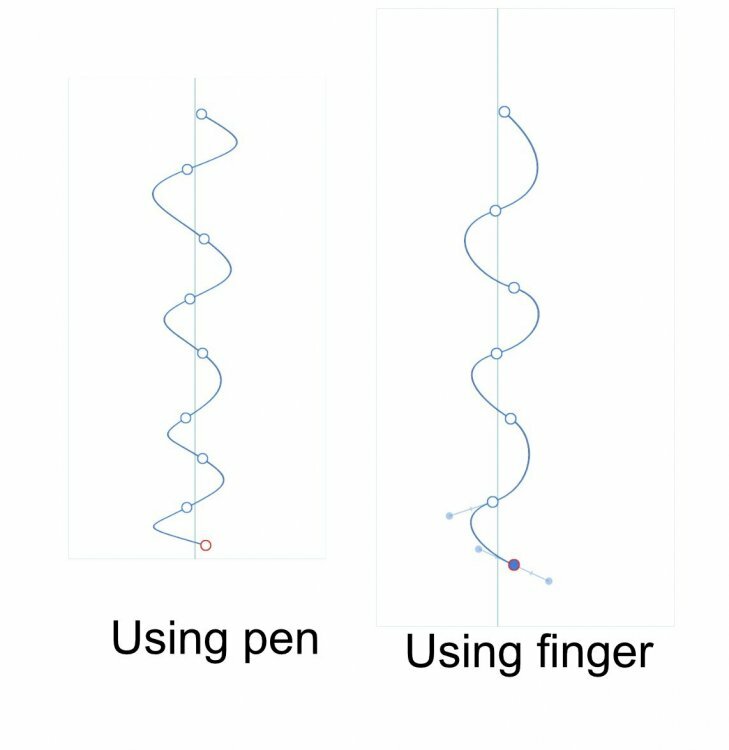 It does appear that Affinity Designer ignores where the gesture started and instead uses the position of the pen/finger at the time it realises a drag is occurring. This bug can get even worse with other factors like zoom level. Hope its squashed soon because I've had to resort to another vector app for now. It's too frustrating as it stands. Hi guys, just want to chime in and say I’m having this issue on a brand new 2018 iPad Pro 12.9 inch too, very frustrating to work with. Just got the app today. Is there any updates on this problem? Completely ruins the flow and fun and is putting me off using the app. Awesome and very impressive app otherwise. As far as I'm aware there's been no acknowledgement or progress on this issue. I'm still quietly hoping they get on top of this because it's the single reason I stopped using the app. But it's been ongoing for several months. Fingers crossed. Maybe if you shared some screenshots highlighting the issue? I attempted to show the issue in the above image but I'm not sure how clear I was. There does appear to be a little 'inaccuracy' in Affinity Designer when placing the pencil on the line. Sometimes above the line sometimes below. In the Vectornator video there does not appear to be any inaccuracy performing the same actions. Not a big deal but evident. I think it’s been covered but here’s a video from my end anyway. I’m more so talking about the lag/delay rather than the accuracy in my case but seems to stem from similar issue. Just to reiterate the problem I’m having. When I click On a node, hold and drag there is a lag/delay before it enventually snaps to where my cursor is. However if I just tap and drag really quickly it moves right away. I have no idea why there is a lag one way and not the other but it’s driving me up the wall! Also, in the vid you can see certain instances when a magnified view of my Selection appears but it appears to be just a still from when I made the click...it doesn’t move or update as I drag so it actually gets in the way of what I’m trying to see. Maybe I’m missing something but is this a bug? If it’s a magnifier, shouldn’t you see the movement update inside the magnification bubble too? Currently the static image doesnt actually help and it gets in the way? Thanks for making those videos. Echoes my experience - slightly off with Affinity Designer and accurate with Vectornator (and other vector tools). I disagree thats its not a big deal though. It really gets in the way of tracing things and can get even worse when theres more going on and zoomed in. It's really curbed my initial enthusiam for this tool and I've held off buying their other apps as a result. I'd say thats part of the same problem. In both cases the app isn't storing the initial position of the gesture and is only using the position at the point it recognises the gesture. At least that's how it appears. For what it's worth, I have submitted the additional comments and videos to development. I have a similar problem while using pen tool or editing nodes afterwards. It‘s very unresponsive, especially if you use the one finger gesture to move both handles separately. Any news on a fix or update? I really like the app, but this makes creating vector art a real tedious process since 90% of that work is done with the pen tool. Im on version 1.6.4.45, original iPad pro 12.5"
I also seem to be experiencing the same issue with the marquee selection tool. So this issue was detected July 2018. It’s now almost April 2019. I just bought this app yesterday and I could not have foreseen that a basic function like manipulating handles and points would be an issue in such an advanced app like this. This is slowing my workflow down a lot! I really don’t get how an important feature like this has not been solved almost a year later! So now I spend almost €20 for this app and stick to Vectornator, witch is a free app, because of this issue. Btw in Vectornator manipulating handles and points work flawlessly.